More and more people are turning to resistance bands because they deliver an effective and full-bodied strength training while reducing injuries at the same time. Here are 15 of the top resistance band exercises to transform your body into a lean and sturdy machine. If you want a high quality set of resistance bands, then I would recommend Bodylastics Resistance Bands due to their solid construction. 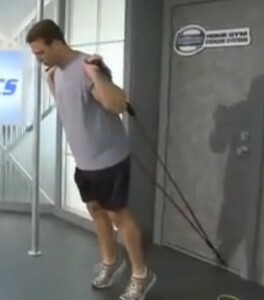 Loop the middle of the resistance band around a couch leg or any other non-movable object. Get in the crunch position with your arms straight over your head, holding the resistance band handles. Keeping your arms straight, slowly crunch up, hold for a couple seconds, and then slowly return to start. For six pack abs training, do 2 sets of 25. 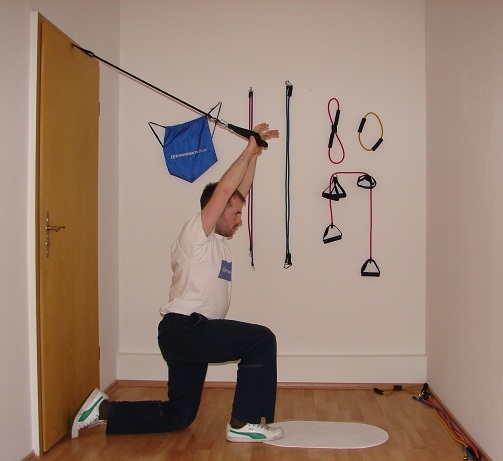 Alternatively, you can perform this exercise standing up, kneeling or sitting down with the resistance band tied higher up to a heavy frame or using a door anchor. Lay in the crunch position with the resistance band looped around your knees and the handles held in your hands. Your hands will be kept down by your sides on the ground holding the handles of the resistance band tightly. Tighten your abs and lift your knees up, doing a reverse crunch move. Do 2 sets of 25. Place your door anchor near the top of the door you will be using and attach the resistance band. Make sure that you have room around you to move your arms freely. Grab the handles while keeping your back facing the door. Stand forward enough so that the resistance bands are slightly stretched. Bring your arms forward so that your elbows are straightened and your knuckles are pointing up. Bring your arms back into the position it was in before, then repeat. Stand on top of your resistance bands with your feet set slightly more than hip width apart. 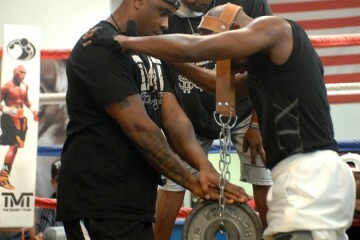 Squat down and grab the handles, then bring it behind you so that you end up with the palm of your hands facing forward, held aligned with your neck. Stand up while keeping the handles aligned with your neck, then hold for a few seconds, then squat back down and repeat. 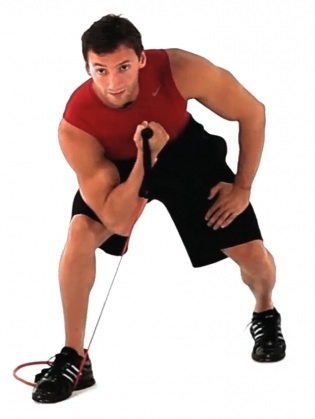 Attach the resistance band at low level, grab the handles and face away from the door. 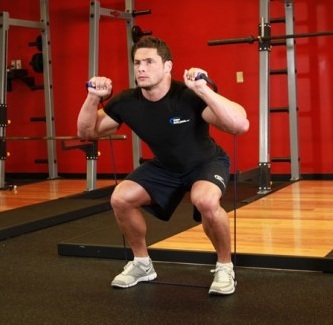 Make sure that the bands are straightened out, and spread your legs to about shoulder width apart. Fully extend your arms outwards and upwards, hold for a few seconds then bring them back down. You can also do this exercise by just standing on the resistance bands with either one or two feet. Holding the handles in each hand, stand on the band with both feet together and your back straight. Grab the handles in each hand and make sure that the band is straightened when your arms are fully extended at your sides. You can do this either by wrapping the band around your hands, bringing your arms out or stand further apart. With your feet together, arms extended and back straight, shrug your shoulders as high as you can, making the resistance band stretch slightly. Stand near the end of one side of the resistance band with your right foot. Hold the hand with your right hand while resting your right elbow on your right knee. Curl your right arm towards your right shoulder. Return to the original position, repeat and switch sides. Stand on top of your resistance bands with your feet set slightly more than hip width apart and grab the handles while keeping your arms by your side. Make sure that your back and the band is fully straightened, then bring curl both your arms up (or one at a time) towards your shoulders. Bring them back down and repeat. Grasping a handle in each hand and stand on the center of the band with one foot and step back with the other. Keep both your knees slightly bent. Keep your hips squared and your chest facing forward. Fully extend your arms out in front of you until they’re at shoulder height and slightly further than shoulder width apart. At the full extension, your fists should be pointed forwards like you are holding onto ski poles, and the band should form a V shape. 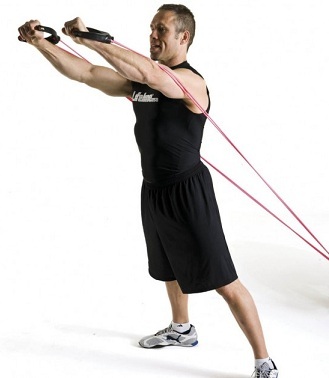 Grab the band at each end so that the center of the band is on your back and your hands are in front of you. Make sure that the band is underneath your armpits. 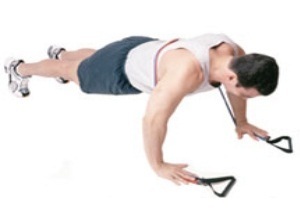 Lie down in a push up position while still holding the ends of the band in each hand. The band should be tight at the lowest point of the push up. Push yourself up until your arms are fully extended, then slowly back down to the original position. Secure the resistance band at the top of a door with a door anchor, or to a secure stationary frame at a comparable height. Facing the anchor point, step back until the band is straightened and grab a handle in each hand at slightly higher than shoulder height. 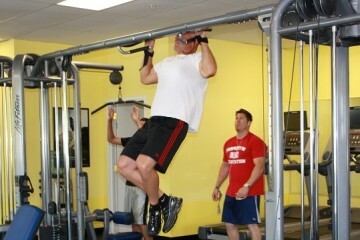 You can also perform this exercise while being seated. 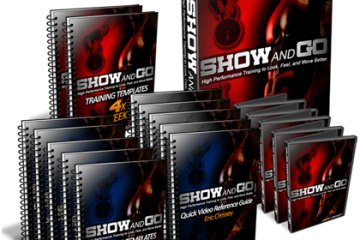 Pull your arms backwards so that your elbows are pointing behind you. Return to original position and repeat. 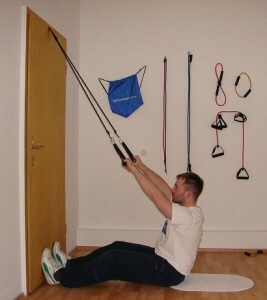 Secure the resistance band at chest height in the door with a door anchor, or to a secure stationary frame. Stand with your side towards the door and hold the handle of the band, making sure that it’s fully straightened. Bring one arm in a sweeping motion, to the center of your body with your arm extended directly in front of you. Return to original position, repeat and then switch arms. You can also use your opposite arm to pull the band across your entire body, or increase the resistance band weight and use two arms instead of one. Hold the handles of the resistance band and fully extend your leg backwards with your toe pointing to the ground. 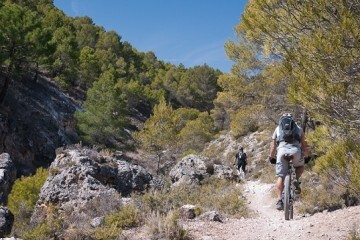 Bring back in to start position and repeat, then switch legs. Secure the resistance band at the bottom of a door or to a secure stationary frame such as your bed frame legs. Attach the ankle straps to your ankles and then to end of each side of the band. Lie flat on your front with your hands together centered on your chest. Make sure that the resistance band is straightened, keep both feet together, then proceed to raise them up to a 90 degree angle, then all the way back down and repeat. Secure the resistance band at the bottom of a door, just like exercise no.14, but you’ll be using handles this time. Facing frontwards (with your back to the door), grab the handles so that the palm of your hands are facing frontwards. Lean forward slightly to make sure that the band is slightly extended, then begin to tip-toe continuously.